So there is a bit of a drive to cut your carbon footprint just now and that’s a good thing but one of the suggestions is that you shop local and whilst that’s a good thing I also think it’s important to think of the little guys and their online businesses and so ladies and Gentlemen I am now going to present to you, you lucky folk, my top tips for making a Christmas hamper using small firms and their online presence. These by the way are firms I like, I’m not being paid by anyone to big them up and there is no whisky here. All Things Nice Food are a two person craft jams and preserve maker from Glasgow, they source as much as they can locally themselves and everything is prepared and stored locally, small carbon footprint too. They also have a basic website offering their supplies so fill your boots. I would recommend their Chilli and Ginger Chutney, yeah you can buy cheaper but a little goes an awful long way. Jaw Brew. A small brewery based on the outskirts of Glasgow offering a decent range of nicely bottled beers, well priced products, the Pale Ale is the business, and a nice website offering their fare, another company who try and keep their footprint down so well worth a mention, well done them and look out for a few beer reviews next year if I have time. Now, one company I cannot miss out is Anges De Sucre, yes I’m well aware they are expensive little sweeties but they are also magic, my tongue and cheek review of them is here so have a gander and then bite the bullet, a perfect addition to any hamper, muffles are must should be their slogan and if they start to use it I want some free muffles. Okay, so we’ve got jams, chutney, beer and sweets in our hamper so let’s move on to meat, I love meat but if you’re veggie just skip this bit, it’s okay, I don’t mind. There is, in my mind, only one butcher I can name here if for no other reason than there website is sausages, which is brilliant. Crombies were my local butcher as a child and they haven’t changed a bit, superb quality and decent website. Go on, get some haggis in your life. Cheese time, If I’m treating myself it’s a short trip to the West End, by public transport, to George Mewes, cheese seller to the stars, I’ve no idea if he sells cheese to the stars but I’ve seen someone from River City and one of the guys from Chewing the Fat buying cheese from him so I’m going to go with my gut instinct. 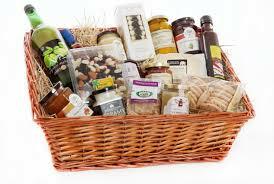 There are cheeses you won’t find on Supermarket shelves so are perfect for my Christmas hamper. What else? Well Mewes and Crombie sell bread and oatcakes so you can get them from their, I really struggled to find a local supplier crafty supplier so let me know if you find one, wine? Wine is a tricky one, I’m trying to stay local which is certainly UK so I’ll go for my favourite, and that’s Chapel Down, I started off with their superb fizz but their still wines are equally superb, a little different and well worth the effort of tracking down or buying online. So there you have it, you can fill your boots with meats, cold cuts, cheese, breads, biscuits, jams and sweeties all washed down with some lovely beer or wine, get in there, you know you want too.